Welcome to this month’s last edition of 3D Printing News Briefs! Today, in honor a new month starting tomorrow, we’re starting with stories about everything new. BEEVERYCREATIVE will soon launch a new 3D printer kit, while Fast Radius is opening a new headquarters and Thor3D welcomes a new CEO. Verashape is introducing the latest version of its SOFTSHAPER software, and Link3D launched a new additive manufacturing scheduling solution. Moving on from new things, Midwest Engineered Systems, an official KUKA partner, will be displaying its technology at IMTS 2018, and a company used its innovative laser cladding technology to restore a CNC spindle. Portuguese 3D printer manufacturer BEEVERYCREATIVE is getting ready to launch a new 3D printer DIY kit, and will present it publicly for the first time at the upcoming TCT Show 2018 in Birmingham. This is a big deal for the company, as it hasn’t introduced had a product launch for a new 3D printer since 2015; employees have been very busy working on the MELT project for the European Space Agency for the last two years, and are more than ready to introduce the new B2X300 3D printer kit. BEEVERYCREATIVE conduct multiple studies before the launch, including market research on 3D printer user patterns and collecting quantitative and qualitative information from users about its helloBEEprusa 3D printer kits. The B2X300 is named for the company’s brand (B), its two extruders (2X), and its 300 x 200 x 300 mm print area (300), and was delivered to several beta testers this spring for testing and feedback. Aside from its build area, number of extruders, and the fact that it features auto bed leveling and trinamic drivers, we don’t know much about the 3D printer kit yet. But all will be revealed by mid-September. 3D printing solutions provider Fast Radius is scaling up its manufacturing footprint, and recently opened its new headquarters in Chicago’s West Loop, which features an advanced, industrial-grade 3D printing facility. This facility is home to extensive HP MultiJet Fusion technology, as well as what the company calls the largest Carbon production facility in the Western Hemisphere. This was a well-thought out location: the building of the Chicago-based Digital Manufacturing and Design Innovation Institute (DMDII) was where the company’s new CEO Lou Rassey first collaborated with several other Fast Radius executives, including Chief Scientist Bill King, PhD, Chief Product Officer John Nanry, and Enterprise Solutions Leader John Ramirez. The rest of the company’s executive team includes Vice President of Sales and Marketing Brian Simms and COO Pat McCusker. Rassey said, “It was important to the Fast Radius team that we were headquartered in Chicago, as we are passionate about being a part of the next great industrial manufacturing renaissance in this city, the Midwest, and ultimately, the world. This week, Moscow-headquartered 3D scanner manufacturer Thor3D announced that it has appointed its very first Chief Executive Officer. The new CEO, Anna Zevelyov, is a company co-founder and a 3D printing market veteran who had been serving as Thor3D’s Sales Director; her long-time lieutenant, Vadim Fomichev, will now be taking on this role. Under Zevelyov’s leadership, the company will be focusing on R&D, with plans to release at least one new 3D scanner each year. “Some history…the company was, until now, ruled by committee. Although periodically, this “collective-wisdom” approach was beneficial, over time we realized that a strict hierarchy and one person at the helm is needed,” Zevelyov wrote in a statement. “The Board of Directors took 6 months to consider whether to nominate a CEO and if yes, who that might be. After much debate about how this could change the culture of the company, the decision was made this month. I was elected unanimously, which, naturally, boosts confidence, as I take on this new challenge. Verashape, which manufactures the VSHAPER line of 3D printers, has just introduced the latest version of its SOFTSHAPER software. Thanks to a license granted to the company by Siemens PLM Software last year, SOFTSHAPER 2019 is based on Parasolid Communicator. There are many improvements and new features in this latest version of SOFTSHAPER, including a technological process tree, detailed reports, and the ability to group layers and print manually adjusted supports. Two years ago at IMTS 2016 in Chicago, KUKA Robotics showcased how its robots integrate with 3D technology thanks to partnerships with companies like Midwest Engineered Systems (MWES), a leader in complex systems integration. MWES provides services such as robotic welding, machine tending, material handling, and automated production lines, but has become well-known in the last few years for its work in laser wire additive manufacturing. This technology is able to create very large parts, while also saving up to 90% of the material normally machined away. “We’ve actually come up with a way way to print with metal using wire. Really what that does is allows you to print larger parts and it allows you to print them faster,” said Scott Woida, the President of MWES, in a video. The company’s additive manufacturing system uses the hot wire process to preheat wire before it enters the molten pool. At the upcoming IMTS 2018, you can check out the MWES technology for yourself at KUKA’s Booth N-236200. A company called Synergy Additive Manufacturing LLC (SAM), which claims to be one of the only turnkey jobshops to offer metalworking services like final machining, heat treating, metal forming, 3D CAD design, and 3D printing, also developed a laser cladding process is a more cost-effective alternative to hard chrome coatings. The company offers a 24 hour turnaround on the dimensional restoration of rotating components, like motor shafts and CNC spindles, using this technology. Laser powder bed fusion 3D printing requires a great deal of effort to make sure that quality parts are being produced – and there are a lot of things that can go wrong with metal prints, such as porosity and residual stress, which causes distortion and part failure. Therefore, it is important to optimize the machine parameters as much as possible. In a paper entitled “3-Dimensional heat transfer modeling for laser powder-bed fusion additive manufacturing with volumetric heat sources based on varied thermal conductivity and absorptivity,” eight 3D heat sources used for simulating laser powder bed fusion are compared, and new equations for varied thermal conductivity and laser absorptivity are proposed. The schematic of the heat source models, (a) cylindrical shape; (b) semi-spherical shape; (c) semi-ellipsoidal shape; (d) conical shape, (e) radiation transfer method; (f) ray-tracing method; (g) linearly decaying method; (h) exponentially decaying method. Therefore, the researchers propose effective simulation models with certain approximations and assumptions to predict the dimensions of melt pools, in order to reduce the computational time. Experiments were carried out on an EOS M 290 machine. A 3D heat transfer finite element model for laser powder bed fusion was developed for accurately predicting melt pool dimensions and surface features. Temperature-dependent thermal material properties (a) density of SS17-4PH; (b) thermal conductivity of SS17-4PH; (c) heat capacity of SS17-4PH; (d) material properties of mild carbon steel. To improve the model performance, a mathematical model with varied anisotropically enhanced thermal conductivity and varied absorptivity was proposed and applied to the heat transfer simulation with the exponentially decaying heat source. “The expressions of varied anisotropically enhanced thermal conductivity and varied absorptivity were linear algebraic equations,” they state. “Good agreement between the simulation and the experimental results was derived. The averaged error of melt pool width and depth are 2.9% and 7.3%, respectively. They also concluded that the heat source expressions can be linear while causing the simulation results to be in better agreement with both experimental melt pool dimensions and track surface morphology. Authors of the paper include Zhidong Zhang, Yuze Huang, Adhitan Rani Kasinathan, Shahriar Imani Shahabad, Usman Ali, Yahya Mahmoodkhani, and Ehsan Toyserkani. It seems safe to say that self-healing materials are extremely fascinating. The 3D printing world has shown them increasing interest lately, with potential applications including electronic devices and cartilage replacements. Last summer, a team of researchers at the University of Manitoba created a new method of designing conductive, 3D printable, self-healing hydrogel materials to make them mechanically stable, which involved both physical and chemical cross-linking. Schematic of the injectable “A+B” hydrogels using double barrel syringe, which are cross-linked by covalent bonds during or after injection. 3D hydrogels are hydrophilic polymeric networks cross-linked by either chemical covalent bonds, physical interactions, or a combination of the two. Because of the crosslinks between polymer chains and their hydrophilic nature, hydrogels can actually swell up to a hundred times, or even a thousand, of their dried mass without needing to be dissolved in water. While hydrogels used to be pre-prepared and implanted into target sites within the human body during surgical procedures, they can now be easily injected from a syringe through a fine needle, making the material perfect for biomedical applications. According to a dissertation, titled “Injectable Composite Hydrogels Based on Metal-Ligand Assembly for Biomedical Applications,” by Liyang Shi with Uppsala University in Sweden, injectable hydrogels are very useful in developing minimally invasive surgical procedures, as they “avoid damage of surrounding tissues during implantation surgery” and can easily fill defects with complex shapes in situ. In addition, it’s not difficult to 3D print injectable hydrogels so they form more advanced, customized morphology hydrogels by automating their extrusion from a syringe and programming the movement in a CAD file. Overview of various HA-BP based hydrogels presented in this thesis and biomedical applications for which the hydrogels were utilized. Derivatives HA-BP (i), HA-BP(ii), and HA-BP(iii) represent three different types of attachment of BP moieties to HA backbone. Shi used hyaluronic acid (HA) as the polymer, because it is both biocompatible and biodegradable. First, it was modified with bisphosphonate (BP) as chelating (heterocyclic ring-shaped chemical compound) ligand. The hydrogel precursors consisting of the polymer chain containing UV cross-linkable groups are ejected out from syringe at liquids which is followed by polymerization cross-linked in defect area using light. The hydrogels created during the experiment “exhibited dynamic features” like shear-thinning and self-healing properties. Shi applied four types of hydrogels based in HA-BP to different biomedical applications, including 3D printing, wound healing, bone regeneration, and controlled delivery of anti-cancer drugs. Shi used a homemade 3D printer to extrude Am-HA-BP•Ca2+ hydrogel, before using UV radiation to create a 3D tube-like construct with multiple layers. Using a rat model with full-thickness skin defects, HA-BP•Ag+hydrogel was able to increase the wound healing process, along with the thickness of the rat’s new epidermal layer. Preparation process and injectable properties of HA-BP•CaP@mSF hydrogel. The hydrogel is formed by addition HA-BP polymer binder to CaP@mSF dispersion, and cross-linking by the coordination bonds of BP groups on HA backbones and CaP on the microfibers. For visualization, alcian blue as a dye was dissolved in the hydrogel. “In summary, this thesis presents metal-ligand coordination chemical strategies to build injectable hydrogels with dynamic cross-linking resulting in time-independent injection behavior. These hydrogels open new possibilities for use in biomedical areas,” Shi concluded. ” is a study of studies, looking at where 3D printing studies are largely coming from, and who is conducting them. The researchers used scientometrics, or the study of measuring and analyzing science, technology and innovation. They collected their data from the Web of Science database, looking at a period of 35 years, which is about how long 3D printing has been around. 11,529 bibliographic records were obtained and analyzed using VOS Viewer, a software tool for constructing and visualizing bibliographic networks. Automatic Inspection of Printed-Circuit Boards.” If you’ve ever tried wading through the mass of studies surrounding 3D printing and wondered where it all began, there you have it. Not only is the number of studies growing each year, it’s growing significantly. The number of studies doubled -and then some – for the first time in 2014, to 1,083 from 2013’s 483. Two years later, the number doubled once again, going from 1,860 in 2015 to 3,016 in 2016. In terms of bioprinting papers, the United States was the leader again, followed by China and Germany. Authors of the paper include Raluca Marinescu and Anişor Nedelcu. Plastic is the least expensive, most used 3D printing material out there – as an example, right now on my desk, I have seven little animal figurines, and one tiny Pacman ghost, all 3D printed out of plastic. Of the plastics, ABS and PLA are the two most popular, and PLA (polylactic acid) is more rigid, easier to color, and considered to be more environmentally friendly than ABS. It’s a polymer from renewable resources, with excellent mechanical properties and fluidity, and its low toxicity makes it a good choice for applications in the medical field. But, while PLA is good for 3D printing very detailed items, it’s also easier to break these items, though the material is less prone to breakage during extrusion-based 3D printing. A collaborative team of researchers from the Shandong University of Technology, the Shandong Research Center of Engineering and Technology for Clean Energy, and Anhui Aile Door and Window System Engineering Co., Ltd. were interested in looking at the defects in PLA properties, like high brittleness, poor thermal stability, and low glass transition temperature, that limit its use in further applications. The researchers also wanted to see if they could modify PLA to make it better. The team recently published a paper, titled “Effects of Lubricant and Toughening Agent on the Fluidity and Toughness of Poplar Powder-Reinforced Polylactic Acid 3D Printing Materials,” that presents and discusses the effects of wood flour, lubricant, and flexibilizer on the fluidity and impact strength of PLA 3D printing materials. Filamentary 3D printing materials samples and 3D printing plate. Materials for FDM 3D printing need to meet environmental requirements (i.e. be safe, non-irritating, and non-toxic), be suitable for melting temperature, and have low shrinkage and high mechanical strength. In the past, other researchers have tried to reinforce and modify PLA materials by mixing them with materials like plastic polycaprolactone (PCL), hydroxyapatite, polyethylene glycol (PEG), and modified cellulose nanocrystals. But due to its low cost and rich source, fiber reinforcement is the most common way of modifying PLA. Other researchers have added coconut shell powder to PLA, filled it with wood flour, and mixed it with wood flour, though results from the wood flour showed that it had a negative effect on the PLA’s rheology. So fiber can also negatively impact PLA, by increasing its viscosity and reducing its melt index, among other issues. Impact strength of 3D printing materials. Maximum and equilibrium torque of different samples for 3D printing materials. 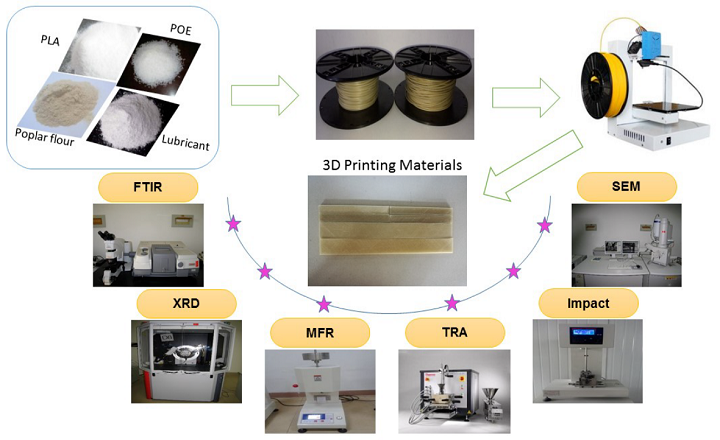 The researchers decided to give it a go anyway, and reinforced PLA with wood flour – more specifically, poplar powder – to make a new 3D printing material, and attempted to change the material’s fluidity and toughness by adding lubricant and a flexibilizer. The materials were fabricated with a 3D printing consumables extruder at 180 °C. Co-authors of the paper are Qingfa Zhang, Hongzhen Cai, Andong Zhang, Xiaona Lin, Weiming Yi, and Jibing Zhang. 3D bioprinting isn’t just about the quest to print working organs, although that is the goal of many in the field. But it also has many more immediate applications, such as, for example, better wound dressings. In a thesis entitled “Design of a 3D printed nanocellulose based moisturizer for wound dressing applications,” a student named Cristian Ghibaudo discusses using 3D bioprinting to create better wound treatments. Ghibaudo points to a project called the Onskin project, for which the aim is to develop novel wound dressings based on microfibrillar cellulose, or MFC, and sustainable materials. Ghibaudo discusses the use of bioprinted nanocellulose hydrogels, with or without living cells included. After the development and characterization of materials was completed, several wound dressing prototypes were 3D printed. Two types of prototypes were produced: flat and concave. The concave prototype had several disadvantages, one being that it took seven hours to print. The 0.41mm nozzle created a low printing resolution, though a higher resolution would have required an even longer printing time. In addition, the channels in the prototype needed to be designed from the STL file; they could not be created automatically from the printing process. The flat prototype, on the other hand, had good mechanical properties and high resolution, plus it printed in only 30 minutes. Thus, the flat prototype was selected as the best choice for the final model. Both prototypes were designed to cover an inner elbow wound, and the flat dressing showed itself to be flexible enough to cover the uneven surface. Once the best design was settled on, it was found that 3D printed wound dressings can be highly effective; both the material and the structure of the dressing met the requirements listed above. There’s still time to save on Trends & Innovations in Dentistry, our three-day online event starting September 25. If you sign up by tomorrow, September 1, you’ll receive 23 percent savings. Learn the latest dentistry innovations in this conference-style online event with live guest speaker sessions, product demos and audience Q&A sessions, plus ongoing discussions broken out into various industry categories. Speakers include industry thought leaders, like Samuel Wainwright, Dental Product Manager at Formlabs. Check out the full speaker roster here. All sessions are recorded and archived so you can watch any time. When you sign up at our early bird rate, you’ll also get immediate access to archival video recordings from related courses so you can start learning right away! Want to learn about how 3D printing is making an impact across industries? You can also sign up for our other fall classes, 3D Printing in Metal and 3D Printing with Polymers, starting September 18 and October 16, respectively. Optical images of SLA 3D printed complex-shaped parts. (a) Hollow glass; (b) gear wheel and (c) the spiral piece. Stereolithography, also referred to as SLA and SL, was the first 3D printing method invented, and while for a long time it was only considered to be a prototyping solution, we’re long past those days. This versatile technology can produce accurate, high-resolution parts with smooth surfaces, diverse build sizes, consistent properties throughout, and can also access a wide range of material properties. All of these features explain why SLA is so often used now for applications in tooling and patterns, such as injection molding, investment casting, and thermoforming. A group of researchers from Zhejiang University in China recently published a paper, titled “A cross-linking strategy with moderated pre-polymerization of resin for stereolithography,” with the Royal Society of Chemistry. The study explains how the team worked to improve stereolithography, by providing parts, 3D printed with SLA technology, with better mechanical properties. The slurry synthesis and stereolithography process of the whole process. The researchers explained that SLA is not often used for final parts production, which is why there’s “a need to continuously improve existing processes and materials.” They aimed to do so with a cross-linking strategy popular in coating technology. SEM images of an unpolished resin sample (type 3, 1000 mW, 100 mm s−1). (a) The front surface of the resin sample; (b) and (c) the side surface of the resin sample. They used HEMA, IDPI, and PEG to make the pre-polymer, and added diluents agents to modify the resin’s viscosity, because the pre-polymerization slurry was too sticky to use for SLA. After adjusting the software to match the slurries’ viscosity, the team 3D printed several 10 x 10 x 10 mm sample squares. After adjusting the laser power and scanner speed as well, they discovered that the three kinds of slurry had different typing ranges. The researchers were able to show that that the crosslinking strategy of polyurethane-acrylate polymer could be applied for pre-polymerization in the resin slurry’s 3D printing synthesis. They also demonstrated that resin characteristics can be tailored for use in different applications by using variations of diluents. Co-authors of the paper include Rongping Ni, Bin Qian, Chang Liu, Xiaofeng Liu, and Jianrong Qiu. It’s an unfortunate fact that a lot of things can go wrong when 3D printing. Many people who are unfamiliar with the technology think that it’s like magic: you just press a button and out pops a finished, perfect part. But with every 3D printing technology comes its own problems, and there are plenty in FDM/FFF technology. Poor adhesion, warping, nozzle clogging, and spectacular meltdowns that seem to happen for no apparent reason – they’re all part of the 3D printing adventure. One of the biggest issues that causes prints to fail or come out imperfectly is moisture. Many polymer filaments are hydrophilic, which means that they like moisture and will happily absorb it from the air surrounding them – that’s why spools of filament commonly come in airtight containers with little desiccant bags in there with them. This is particularly true for materials like PLA and nylon, which are more hydrophilic than others. So what happens when filament absorbs moisture? 3D printing filaments are made from polymers, which are in turn made up of multiple monomers joined together. Those polymer chains can break down, however, or depolymerize, and one way that this can happen is a process called hydrolysis, which is when a water molecule breaks a polymer chain. So when a supply of filament gets wet and is then extruded, the water inside it vaporizes, causing air bubbles and voids – you’ll know this has happened if you start hearing snapping and crackling noises while printing. This can weaken material and cause poor inter-layer adhesion, as well as poor surface finish. It’s just not a good thing, but unfortunately it’s all too easy for filament to draw in water from the atmosphere and get messed up. On the bright side, the damage is not irreversible, if you dry the filament out before you extrude it. For this purpose, there are filament-drying products, and one of the newest is the Apium Filament Dryer from German company Apium. Apium is focused on industrial 3D printing solutions, a leader in PEEK and other high performance polymers. The Apium Filament Dryer was developed in partnership with Singapore’s Purpose AM Systems and promises less oozing, stringy filament caused by moisture absorption, as well as better interlayer adhesion and mechanical properties. The Apium Filament Dryer has thermally insulated walls, which reduces heat loss, and offers front loading which enables easy filament interchange. It has a rotary desiccant system for the dehumidification of incoming air, as well as a set of HEPA and active carbon filters. It is compatible with all Apium P Series 3D printers and Apium filaments, as well as several other open-system 3D printers. Apium is ready to ship the filament dryers upon order and offers a 12-month warranty. Phantoms are models of organs that can be created to test things like proper medication dosage, for example. In a paper entitled “Recent advances on the development of phantoms using 3D printing for imaging with CT, MRI, PET, SPECT, and ultrasound,” a research team discusses the 3D printing of phantoms. Is the resolution of 3D printers sufficient for existing imaging technologies? Can materials of 3D printed phantoms produce realistic images representing various tissues and organs as taken by different imaging modalities such as computer tomography (CT), positron emission tomography (PET), single‐photon emission computed tomography (SPECT), magnetic resonance imaging (MRI), ultrasound (US), and mammography? How feasible or easy is it to print radioactive or nonradioactive solutions during the printing process? The researchers review several published cases of 3D printed phantoms of multiple parts of the body. The resolution of the 3D printers used is, according to them, sufficient for 3D printing phantoms. There is a lot of potential for growth in this area, the researchers continue, but companies that develop the 3D printers and materials should consider a wider range of material properties useful in medical imaging. They also propose the development of a 3D printer specifically designed for 3D printing phantoms. The paper is an extremely detailed look at the many 3D printers and materials used to 3D print phantoms, and it also suggests looking more toward the bioprinting of phantoms for better biological realism. Soft, moving 3D printed phantoms are discussed, as well as phantoms containing fluids and radiotracers. 50 studies are discussed in total, and overall the researchers conclude that 3D printing is an effective method of producing phantoms – and that it has a lot more potential to do so in the future. Authors of the paper are Valeria Filippou and Charalampos Tsoumpas.